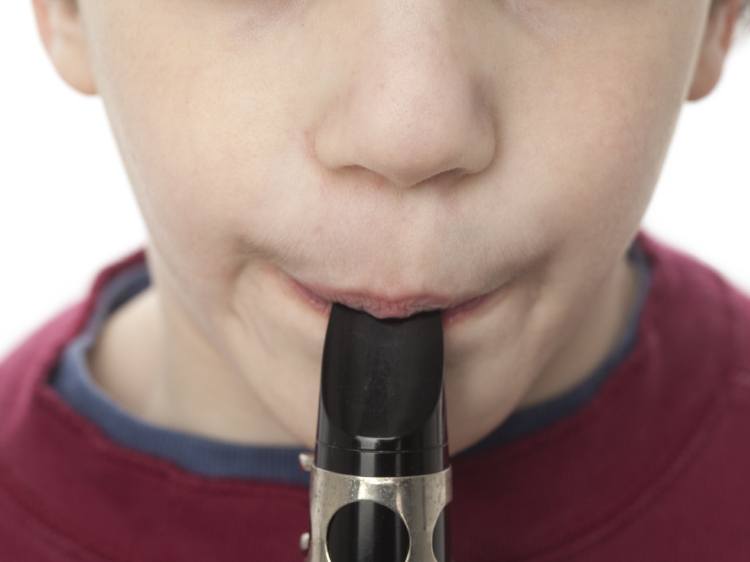 Take A Deep Breath: That Clarinet Could Be A Germ Factory : Shots - Health News Researchers found bacteria, mold and fungus in tests of more than a dozen children's band instruments. The parts musicians put in their mouths were the most contaminated. Playing music in the band is good for kids, but maybe not so much if that clarinet is a cesspool of bacteria and fungi. That's the provocative suggestion from the Oklahoma State University for Health Sciences, where researchers found germs galore growing on brass and wind instruments that were used in high school band programs. The researchers in Oklahoma City Tulsa swabbed 13 brass and wind instruments, then rubbed the swabs on petri dishes and waited to see what would grow. They found 295 different bacteria as well as yeasts and molds. The parts that musicians put in their mouths were more contaminated than the rest of the instruments, and the two clarinets showed more contamination than the other instruments. The results were published in the latest issue of General Dentistry. OK, that's gross. But does having bacteria in your bassoon really pose a health risk? Yes, says Thomas Glass, a dentist and professor at Oklahoma State who was lead author of the study. In the past he has tested for pathogens on toothbrushes, dentures, and athletic mouthguards. So he wasn't too surprised to find gunk growing on band instruments. "The bacteria can produce local infections in the mouth, in the gastrointestinal tract, and in the respiratory tract," Glass tells Shots. Molds can cause allergic reactions, and skin infections are a risk, too, he says. Glass's study didn't look to see if the high schoolers who played these grubby instruments had health problems. And there's precious little evidence of rampant infections associated with practicing "Stars and Stripes Forever." But a few pulmonologists have reported patients coming in with lung problems. A letter from 1988 in the journal Chest told the tale of a 67-year-old saxophone player with a cough and shortness of breath. He was diagnosed with hypersensitivity pulmonitis from candida, and it turned out the saxophone mouthpiece was contaminated with that fungus. The symptoms disappeared after the musician started washing the instrument's mouthpiece with soap and water. More recently, a 48-year-old French saxophonist with inflamed lungs from a moldy saxophone also got a write-up in Chest. In the same issue last September, a pulmonologist at the University of Connecticut Health Center reported on a 35-year-old professional trombone player who had been suffering from a cough and shortness of breath for 15 years. Those symptoms cleared up when the musician started cleaning his instrument with rubbing alcohol. Now, we have to point out that the General Dentistry study was sponsored by Dr. Lorenzo Lepore founder of Encore Etc., Inc. It turns out that Lepore is a dentist, and Encore Etc., Inc. is a company he founded to sterilize musical instruments. We are independent of any conflict of interest. All we have to do in the article is say how we're funded. That has no impact on us in terms of our findings. Ethylene oxide is used to sterilize medical instruments, and it does a very good job. It's also pretty toxic to humans. So we don't think that you're going to be cleaning your mellophone at home with this stuff. Shots can't help but ask if the good doctor isn't being a wee bit alarmist. "Alarmist? We worry about that, we always worry about being alarmist," he tells us. "It's not going to hurt anybody to break down their instrument once a week and clean it." That, he says, is preventive health. "Playing a musical instrument has a certain level of hazard," Glass says. "You can minimize the hazard by being fastidious."